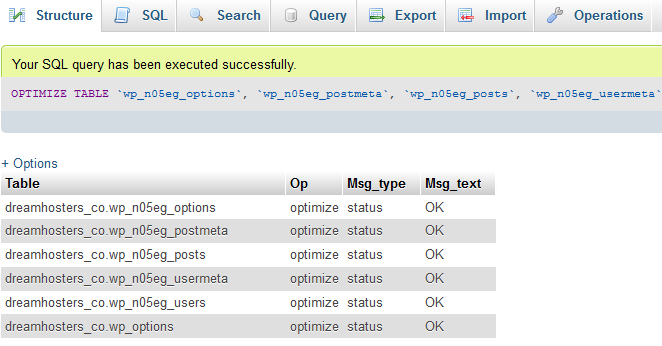 Optimizing your MySQL database tables is one way of making improvements to your website. The optimizing function reorganizes the table and index data, which reduces space and improves I/O efficiency. This guide describes how to optimize your tables via phpMyAdmin. Once you’re logged in, proceed with the steps below. Select your database from the list. Look at the ‘Overhead’ column to the far right – if you see any numerical values, those tables can be optimized. In the example above, only those tables have been selected. You can also click the ‘Check All’ link on the bottom left which selects all tables. 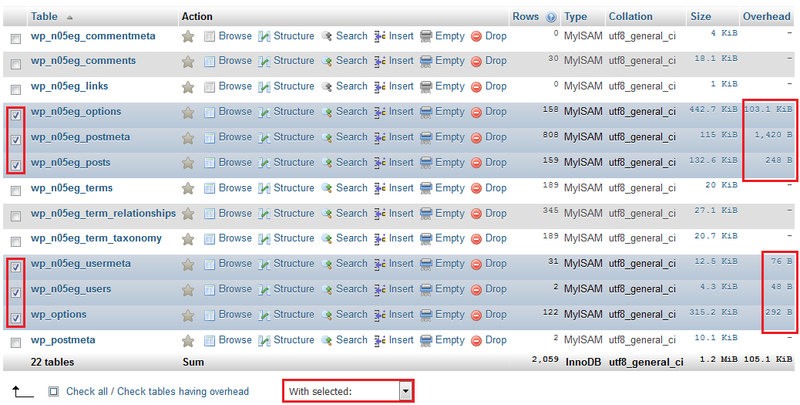 At the bottom of your table list, click the ‘With selected’ dropdown menu. 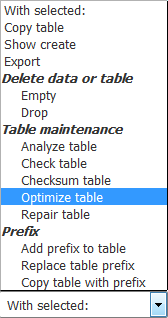 From the dropdown menu, select ‘Optimize table’. You can safely disregard the “Table does not support optimize, doing recreate + analyze instead” message as it's just informational. In addition to optimizing a table, you can also 'repair' a table. Follow all steps mentioned above. 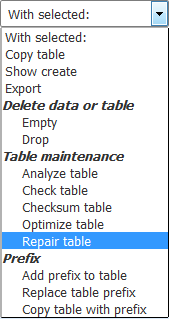 In step #3, choose 'Repair table' from the dropdown menu. Repair Table - Repairs a possibly corrupted table. This is run generally if you’re getting database errors. This can be run via phpMyAdmin or set up as a cron job to have it run routinely. Optimize Table - Simply reorganizes the physical storage for table data and associated indexes. This function improves table access as part of its function is to reduce storage space. Replace the items in all-caps with the actual credentials for your database. Article last updated April 09, 2019 20:51 PST.